The system will automatically delete any post flagged six times as > offensive or spam. The system will automatically delete closed (not as a duplicate), unlocked questions with zero or negative score having no upvoted or accepted answers or pending reopen votes, that were closed 9 or more days ago and haven't been edited in the past 9 days. If I did not miss something, the only case is if the owner's account is deleted and score is less than zero (the fifth point). This happened, for example, here. However, this question was autodeleted, the user still exists and it has one upvoted answer. It was closed but if I understand correctly the second point (which mentions deleting questions having no upvoted or accepted answers or pending reopen votes), if there is upvoted answer, it should not be deleted. The upvoted answer was deleted by its author. 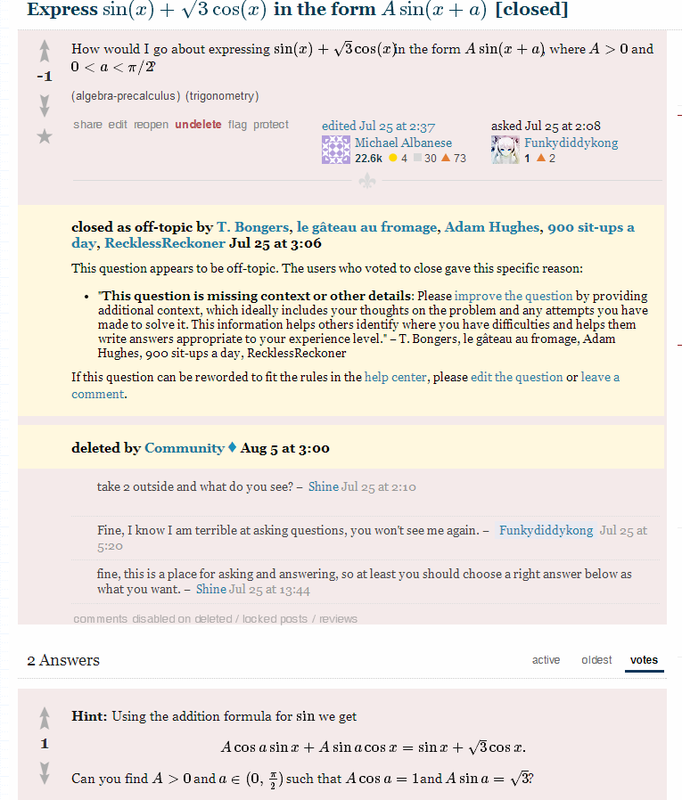 Deleted answers are not considered by automatic deletion scripts. Not the answer you're looking for? Browse other questions tagged support deleted-questions community-user auto-delete .